Well, it's now 3+ years since the last post, and well, beyond noting that it's many of the same posters as today, they're back at work over here. All new construction fences, equipment on site, noise and dust mitigation plans up and running, and as best I can tell, they were already working on demoing the rear wing or 25 Broad. From DOB, it looks like the last filing for 45 Broad was February last year for a 51 story tower with 3 cellars (mmmm, parking...). In any event, the time for building appears to be now. Image of 55 Broad Street via Google Street View. With the upward boom of residential development materializing throughout FiDi, developer Bill Rudin's plan for a 53-story, 742-foot-tall mixed-use tower should fit right in to the neighborhood sans height restrictions. The Post has learned that Rudin is plotting the redevelopment of 55 Broad Street, and has already hired an outside firm to look into the feasibility of expanding the 35-story tower an additional 340 feet into the sky. The building, at the northeast corner of Broad and Beaver streets, could potentially entertain retail, office space, and high-end apartments. Perhaps coincidentally, Rudin's attention has been turned to this slice of downtown real estate following the listing of its neighbor at 45 Broad Street in mid-January. 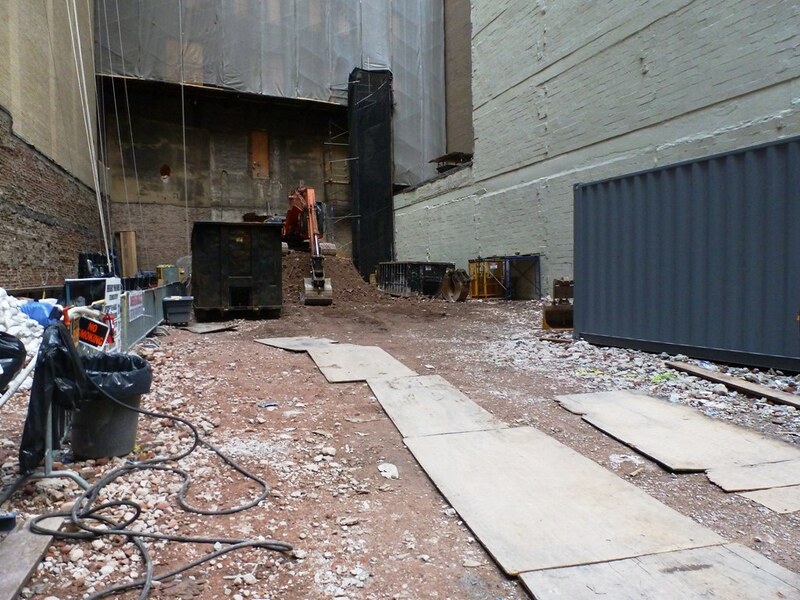 The stalled site, which was once poised to entertain a 62-story hotel and condo tower backed by hotelier Robert De Niro, may come into play with Rudin's 55 Broad redevelopment. Without 45 Broad's competing 'scraper, they sky-space is open for Rudin. The acquisition would add 264,200-square-feet to Rudin's portfolio. 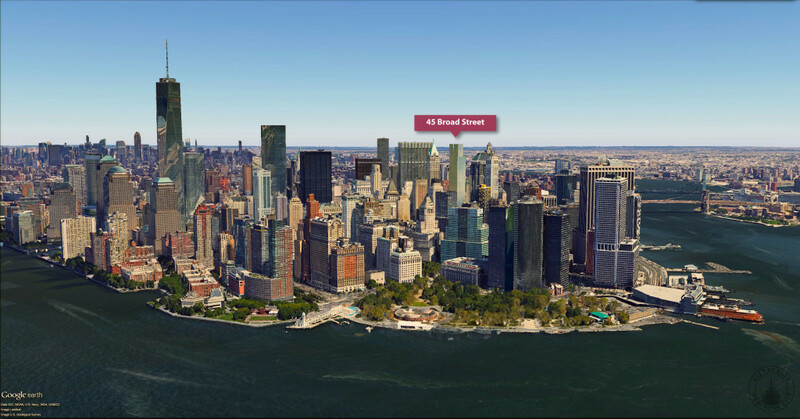 Last October, it was announced that the long-vacant lot in the heart of the Financial District at 45 Broad Street would be redeveloped into a 65-story residential skyscraper by way of a partnership between Pizzarotti IBC and Madison Equities. Now, via Pizzarotti’s project page, we have our first look at the design of the 300,000-square-foot CetraRuddy-designed tower that the development group affirms “will be the highest condo in Downtown Manhattan.” The team will have to move quickly, though; at least two condo towers are proposed to be taller including Shvo’s supertall at 125 Greenwich Street. This tower will be 1,100 ft. and 86 floors. It will be one of the tallest residential towers on earth. Maybe one day it will be filler, but not until Lower Manhattan has many dozens of supertalls. 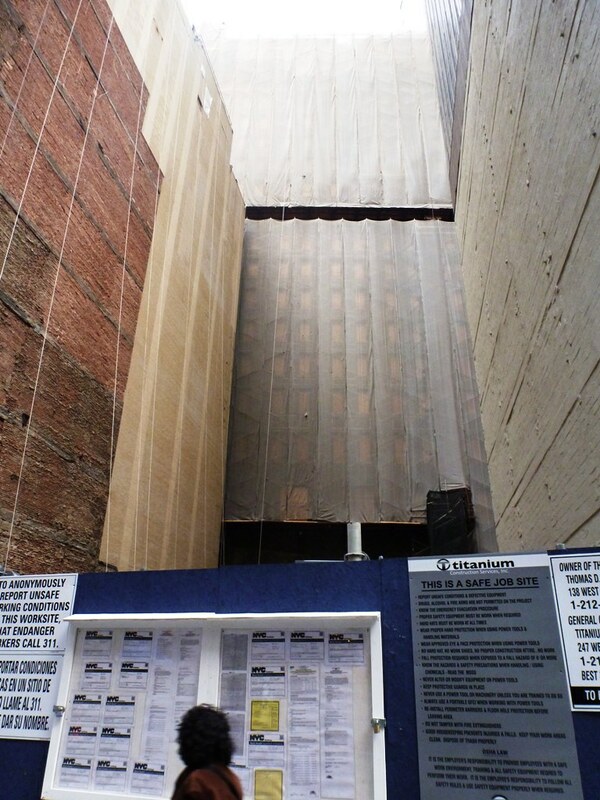 If the building was really 1100 feet, this rendering is questionable at best and downright deceptive at worst. 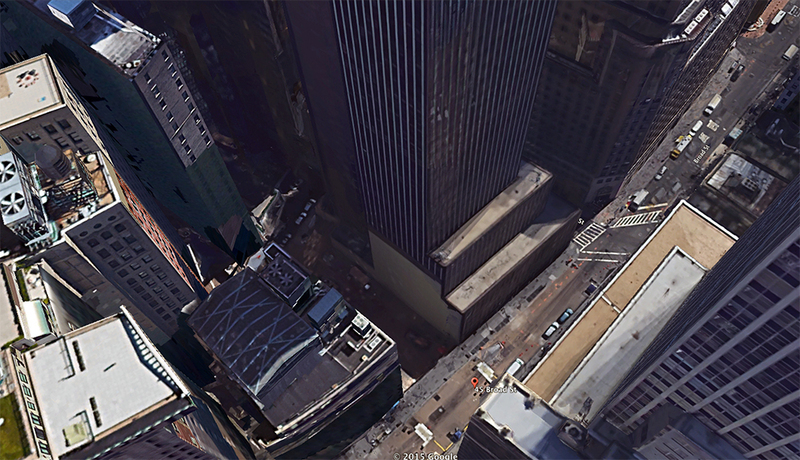 It looks no taller than 40 Wall St (927') or OCMP (813'), when in fact, it would tower over them. 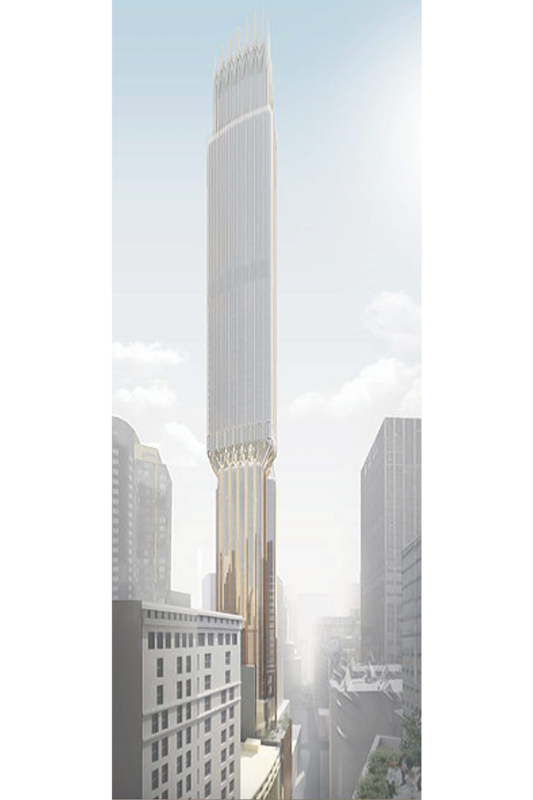 Or, if one were to click through the article, they'd see the tower is to be only 900 feet, and will be mixed in with any number of other tall-but-not-outrageous buildings downtown like the ones I just mentioned. 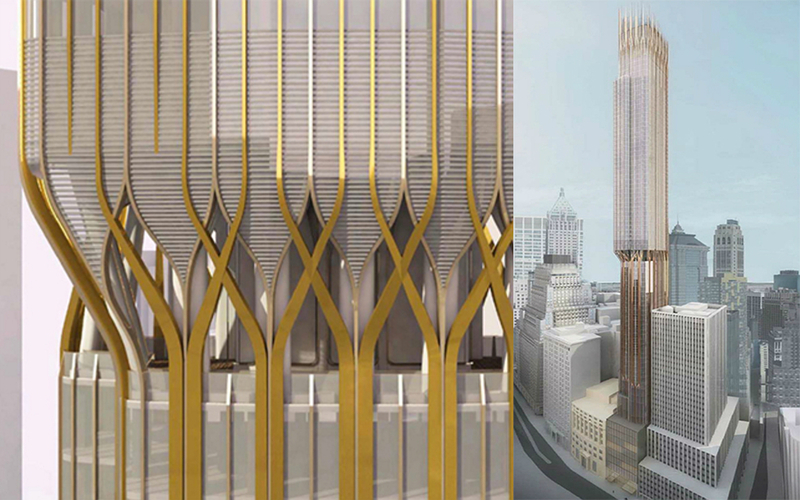 Back in February, the first renderings were revealed of the planned 86-story, 245-unit mixed-use tower at 45 Broad Street, in the Financial District. The renderings originated from EB-5 materials, as the development team – Madison Equities, Pizzarotti-IBC, and AMS Acquisitions – is hoping to raise $75 million in financing through the program. Now, another rendering of the CetraRuddy-designed project has surfaced via YIMBY Forums, which depicts the tower when viewed from the north (looking southward down Broad Street). New buildings applications haven’t been filed yet, but the 1,100-foot-tall tower will encompass approximately 298,000 square feet. The first five floors should host 50,000 square feet of commercial space, while the apartments above should come in studio to three-bedroom layouts. There will also be 20,000 square feet of amenities. Groundbreaking is expected later this year, and completion is ambitiously scheduled for 2018. If this tower isn't phallic, I've been using the word wrong. I don't think any woman would want that spiked crown inserted into her vag!